After the horror of last week’s “New York City Serenade,” Once Upon A Time really needs a new momentum boost as the show starts to integrate the Wicked Witch into Storybrooke. Fortunately, episode writer Jane Espenson (Buffy The Vampire Slayer, Battlestar Galactica), who also penned the stellar Cora-centric episode “The Miller’s Daughter,” delivers with the wise choice to focus “Witch Hunt” on Regina, who was barely visible in last week’s weak effort. Robin Hood: New Storybrooker Sean Maguire was teetering on the fence between attractive and boring, but breaking back into Regina’s castle with the Evil Queen pushed him over into hawt. He’s a thief who supposedly gives to the poor; she’s an Evil Queen with a heart: perfect match. He even suddenly has a young son, Roland, who could help Regina fulfill her motherly instincts after the loss of Henry. The two are so well-suited they spark during a showdown between a choking spell and an arrow. He’s unfortunately not the brightest guy (If a spell is cast on your shoes so that they can’t move, try stepping out of the shoes! If someone is about to commit a kind of sleeping suicide because she misses her son, don’t remind her of your son, which gave you something to live for!). But still we know from Tinkerbell (what happened to her, by the way?) that Robin and Regina are end game. The major problem with last week’s episode is that it set literally nothing in motion to intrigue the average viewer (the Storybrookers are missing a year, really? ), but this week, the Robin-Regina pairing is only one promising development to look forward to. Emma: Another surprise would be Regina’s startling chemistry with Emma. The two basically run their own private investigation firm this week (I could see it working as a series: the new Snoop Sisters! ), as they try to find out who’s behind the new amnesia curse. Parrilla improbably makes us believe that someone could be that torn up over missing Henry, and Jennifer Morrison is helpfully sympathetic as Henry’s other mom. So they team up to fool the town into thinking they’re fighting, and then figure out the fastest way to spread a Storybrooke rumor that will hopefully bring the curse-caster forward (with a hilarious cut straight to Grumpy). Regina even gets Emma to admit that her “superpower” of being able to tell whether or not people are lying isn’t perfect (far from it, since it didn’t clue her into the fact that she was dating a flying monkey for eight months), and the two have some touching moments while they bond while concocting memory potions or wait during a stakeout. Parrilla’s so good with Emma, in fact, that her big showdown with Wicked (Rebecca Mader), falls slightly flat. It’s pretty obvious from the first time Regina mentions “blood magic” that the two were going to be related somehow. Fortunately “Zelena’s” threats against the Evil Queen are enough to snap Regina out of her martyrdom and back into the Evil Queen the show needs so badly: The gleam in Regina’s eyes at the end when she has someone new to destroy is simultaneously amusing and disturbing, a tough combo to pull off. Juxtaposed against the devastation on her face when she’s “introduced” to a Henry that doesn’t remember her, it’s a tour de force performance in a single episode. Although it’s fun to have a glamorous Wicked Witch for once, Mader herself portrays Wicked with a kind of campy menace. She doles out a significant portion of backstory involving Cora and Rumplestiltskin after raiding Regina’s wardrobe and ordering some flying monkeys around. Even the monkeys’ vampire/werewolf-like ability to increase their ranks by biting people ups Once’s horror factor, especially in Little John’s transformation scene (Dr. Whale: “I’m a doctor, not a vet.”). But Mader is nicely subdued in town as she poses as a helpful midwife, easily zeroing in on the Storybrooke’s favorite expectant mother. That’s our Snow: hanging out in a cursed town, not sure who the curser is, but after a little flattery from Zelena, she’s giving a complete stranger control of her pregnant self and her unborn child. Any bets that the baby will be named “Dorothy”? But of course, by far the most hopeful sign for OUAT’s future occurs at the end of the episode, when it’s revealed that Rumplestiltskin is back! Sure, he’s trapped in a cage, and he seems kind of crazy and eats with his hands, but…BACK! This development is the main saving grace of this week, as it sets up all kinds of intriguing storyline possibilities: How did Zelena bring him back? Why did he revert to his former glittery self, without the glitter? How are Belle and Neal going to react when they find him in such a state? How smart a move was it to give Robert Carlyle some scenery like this to chew on? Even in addition to progressions like these, the episode was full of classic OUAT one-liners, like Grumpy wanting to know if the witch is from the west or the east so they know “if we need to drop a house on her or get a bucket of water,” along with a hilarious series of dumbfounded double-takes: Snow’s when Emma reveals she dated a flying monkey, Charming’s when he finds out Emma almost married a monster, and Emma’s when she realizes that the world of Oz is real as well. I am over Henry and the cinnamon for his hot chocolate. But again, the show was spot-on in depicting that a boy Henry’s age would pretty much always have his nose in some sort of electronic device. 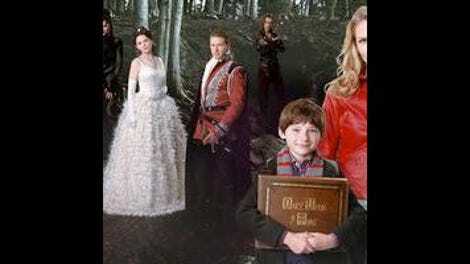 Now that the people in the Enchanted Forest used to live in Storybrooke, there’s an odd but interesting melding between fantasy and the present-day, like when Regina turns a flying monkey into an (ugly) stuffed monkey for Robin’s son Roland, or the Merry Men getting used to modern archery and now stealing from stores. But sometimes it doesn’t add up: Belle knows about Oz because she’ s a bookworm, but Neal seems clueless about what flying monkeys could signify, and he lived in the modern world. Does Meghan Ory’s (welcome) reappearance as Red mean that Intelligence is cancelled?